The Creatalicious Teachers! : NEWS FLASH!! HCA Choir Tour 2011 an outrageous success! NEWS FLASH!! 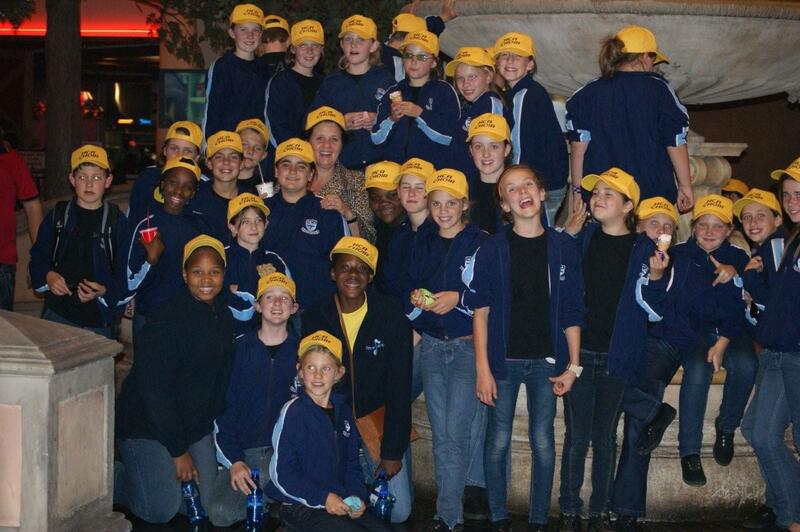 HCA Choir Tour 2011 an outrageous success! 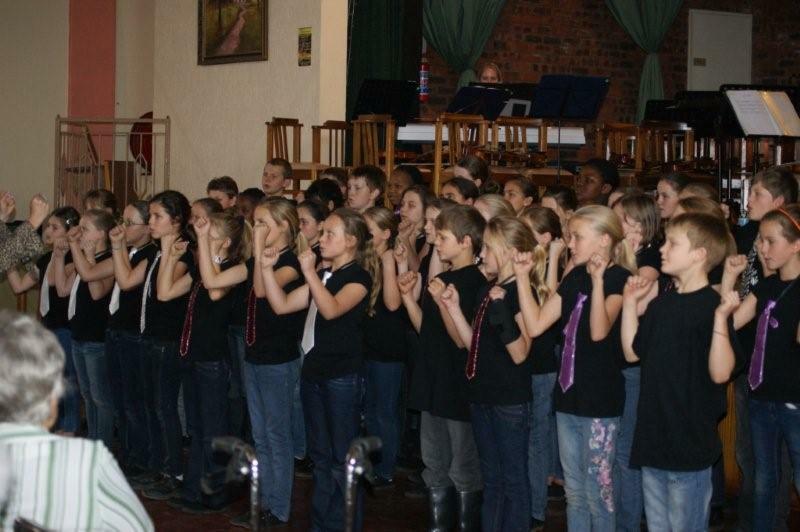 Fabulously talented children wow Benoni audience! Ms Du Casse an adrenalin junkie! (who knew!) Takes on the Anaconda at Gold Reef City! Surprising development: Mrs Hawthorn rides the Anaconda accompanied by Paige! MacDonald’s staff get musical reward for serving 62 meals in 32,5 minutes!! ﻿﻿﻿﻿﻿﻿﻿On Friday 23rd September 42 excited children, 16 parents, Ms DuCasse and myself flew out of King Shaka airport to Lanseria in Joburg for what promised to be another HCA “first”. After months of organising and rehearsing we were finally on our 2011 Choir Tour. But our arrival at Africa Ablaze did not go smoothly when the bus got firmly wedged into both gate pillars in the narrow entrance. We were served a delayed supper with our bags still on the bus and some parents trapped outside in a separate vehicle. After 2 hours and lots of prayer the bus was driven onto the property with damage to the gate, the bus and our nerves! Saturday saw us start with breakfast and a rehearsal before climbing on the bus which was safely driven OUT of the gate (never to come back in! ), and then a drive to Benoni where we first stopped for a MacDonalds lunch. The staff handled the influx superbly and everyone enjoyed their meal, so it was only fitting that we ended off with a spontaneous song to the delight of our startled audience before traveling to the Bunny farm for a quick stop to buy gifts for moms and dads and then to Lynfield Retirement Village and our first concert. 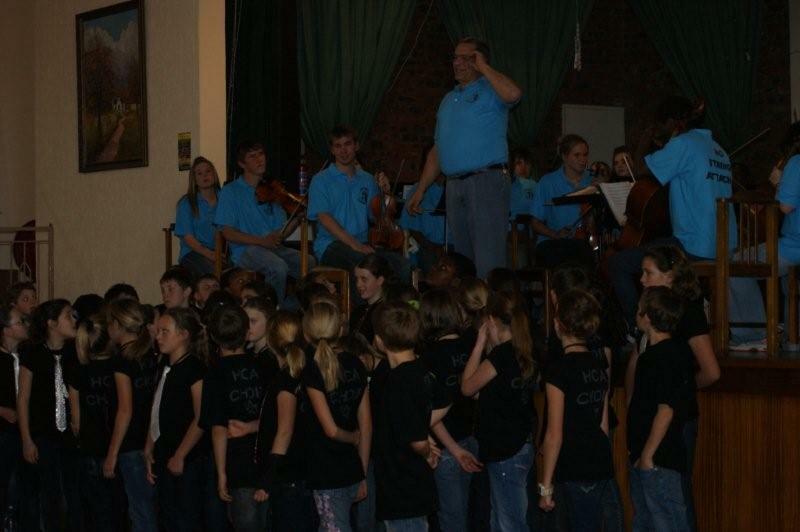 We were warmly welcomed by the East Rand Youth Orchestra and my friend and mentor, conductor Pienaar Fourie. A quick rehearsal with the orchestra was followed by a wonderful concert where our children received a standing ovation and warm cheers for a delightful performance. The orchestra then performed before we joined together for the finale. 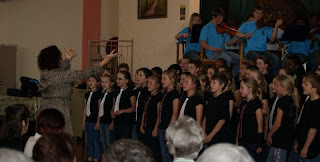 The concert ended on a high with the audience begging for more. Unfortunately, we had to leave to get to Monte Casino and the next highlight on our busy schedule – a performance of “Off-Beat Broadway”, a show starring Anton Luttingh, Paul Du Toit and Lindy Abromowitz – Wanted for Murdering Musicals! It was hilarious and entertaining and their manic condensed versions of Les Miserable with the 3 singers performing ALL the roles, frantically changing hats for each character had us rolling with laughter. Another highlight was a rip-off of “Memory” with the lyrics bemoaning “this stupid musical”! Afterwards we took our aching sides off to supper in the food court area and the children oohed and aahed at the Monte Casino scenery. Our return to Africa Ablaze was uneventful and everyone was soon in bed asleep. Sunday morning was an early start as we had to be at Fourways Community Church by 7.30 for their first service at 8am! My friends and pastors Tony and Susanne Sivewright welcomed us warmly in their beautifully converted building on Monte Casino Boulevard. We sang “I Believe”, “With all my heart” and the National Anthem and people were moved to tears. It was a beautiful and important moment, at this time of controversy in our nation over the singing of songs, to declare “Nkosi sikeleli Afrika”. The children then went off to Sunday School whilst the adults listened to Tony’s challenging sermon on forgiveness. After a coffee break in the glorious sunshine, we repeated our 3 songs for the second service. My highlight of the trip was watching children welcome their extended families, Granny’s, Grampa’s, aunts and uncles and a mother, to the services, relatives who’ve never been able to attend a school event and this was very, very special for the children. 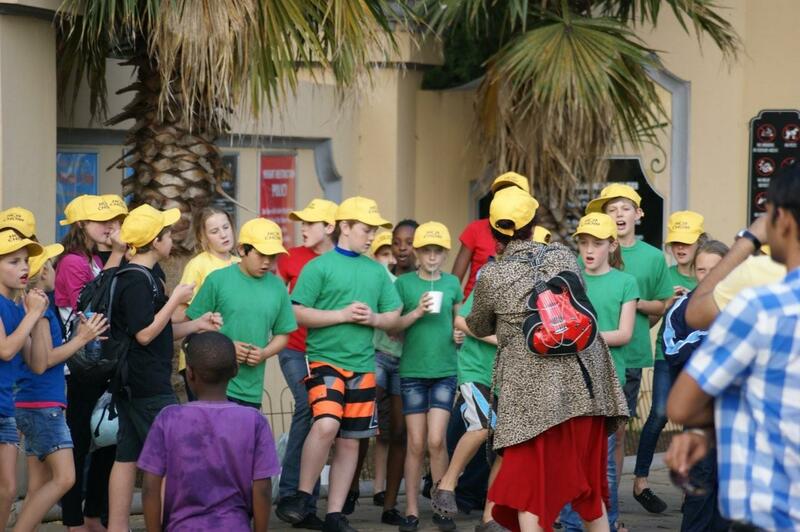 After we’d sung in the second service we left for Gold Reef City and what was undoubtedly the highlight of the trip for every child there! 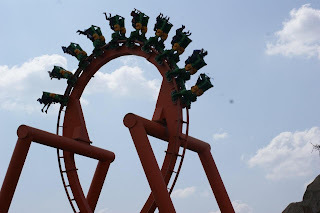 The thrills, screams and excited chatter from even the most reserved children was just wonderful to see. 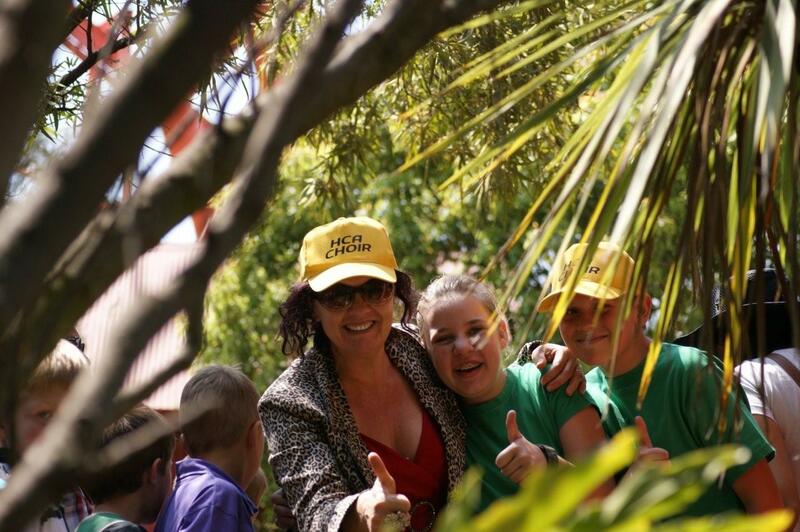 Ms Du Casse really shocked me with her enthusiasm to take on the most death-defying roller coaster – the Anaconda! Eventually I was persuaded by Jessica Campbell to ride with them and I can proudly declare I screamed all the way!! By this time everyone agreed that this tour had to be a regular event and should absolutely include a GRC excursion! Upon our return to Africa Ablaze it was supper followed by our choir party with games and of course the “Howl at the Moon Awards” where the children vote for things like the person “most likely to become a conductor” (or a pop star or opera singer) and “The person who practises in front of the mirror with a hairbrush”. There was lots of fun and laughter and thank you’s and gifts and then bed-time. Monday saw us pack up and say goodbye to the staff at Africa Ablaze (one last glance at that broken gate post!) 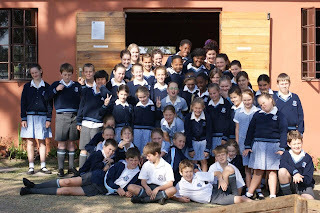 and then a drive to Waverley and St Mary’s School. Once again we were warmly welcomed by our hosts and after a quick rehearsal (we were taught a Tswana song and we taught them our version of the National Anthem), the school were led in for the concert. 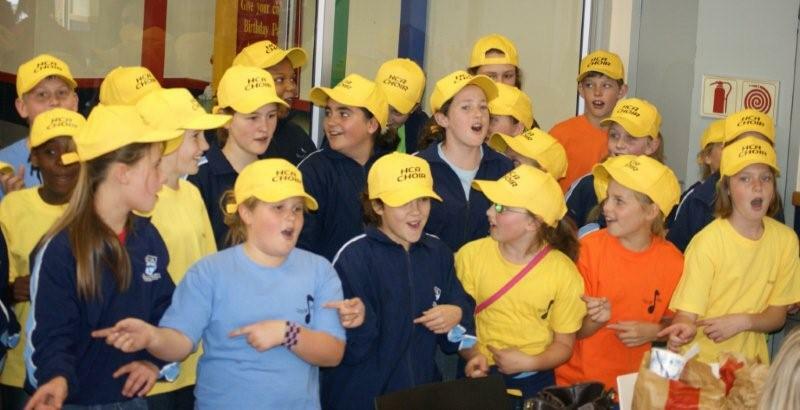 We were impressed with the size of their choir – about half the school is in the choir, and their rendition of “Don’t Stop Believing” and then we started our section with the gumboot dancers. 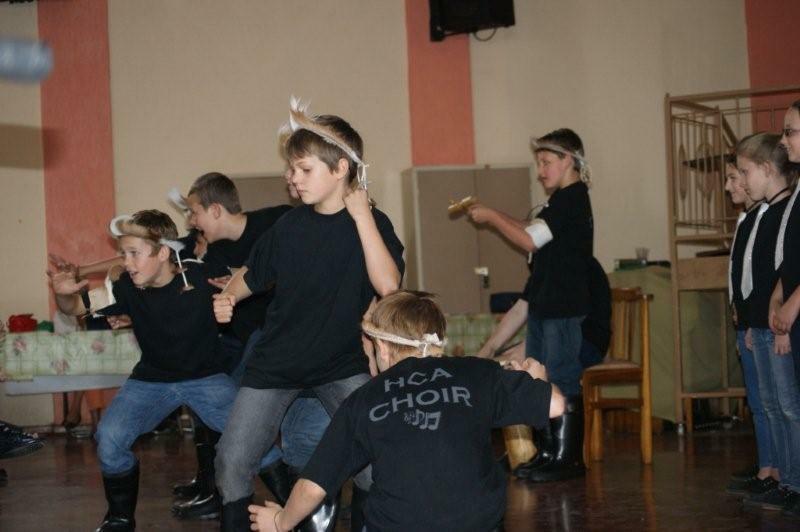 Tim Edley is our leader and the boys enjoy showing off their manly skills but Tim had us in stitches when he went into a Broadway version of the gumboot dance! Priceless! 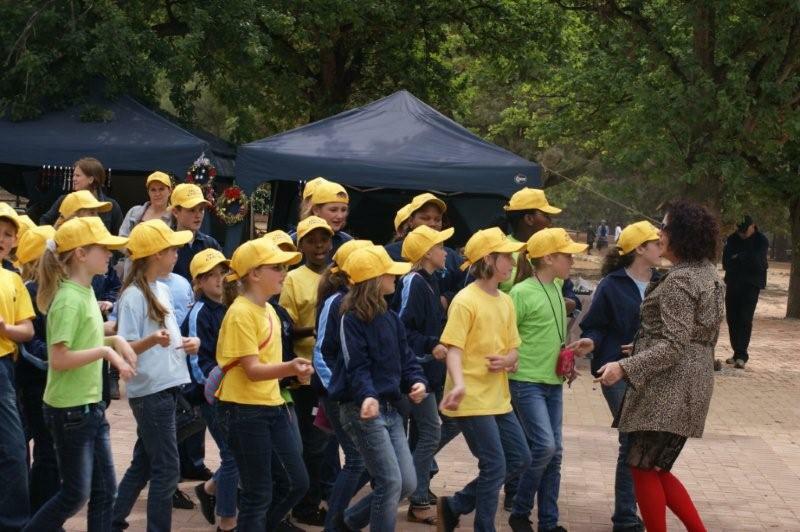 The combined choirs’ performance at the end was beautiful and whilst I chatted to the choir director, Marileen Botha, the children were given a quick tour of their beautiful 120 year old school by some of the Grade 7’s. Then it was back to the bus and our faithful driver Simon, who safely delivered us to the airport. In conclusion, I want to thank all the parents who came with. Their support was vital to the success of this tour. 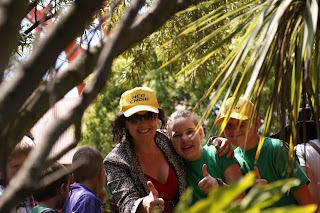 Because each child had a dedicated “parent” we avoided many potential problems and ensured the children were happy and secure the whole weekend. In addition Gina Fyvie, Julia Mardon and others shopped for and packed snacks and drinks and meals. 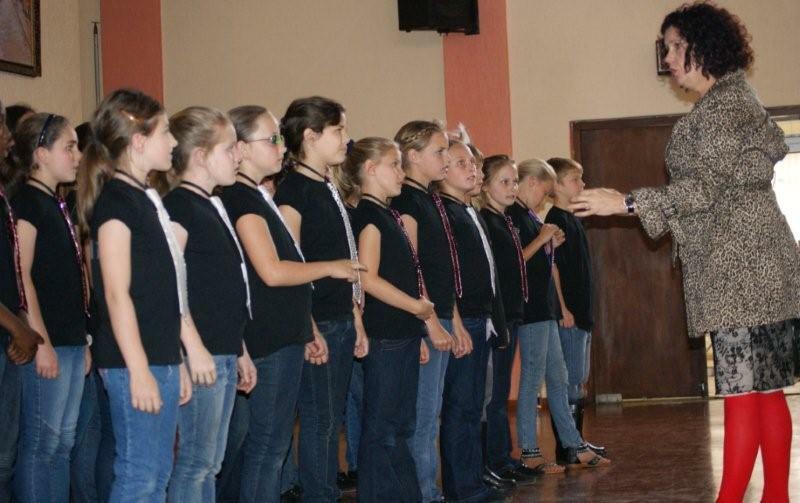 Saskia Mudoch-Eaton was kept busy as our nurse, attending to scrapes and headaches and Anita Duckett as always, made sure each child had their correct choir uniform. 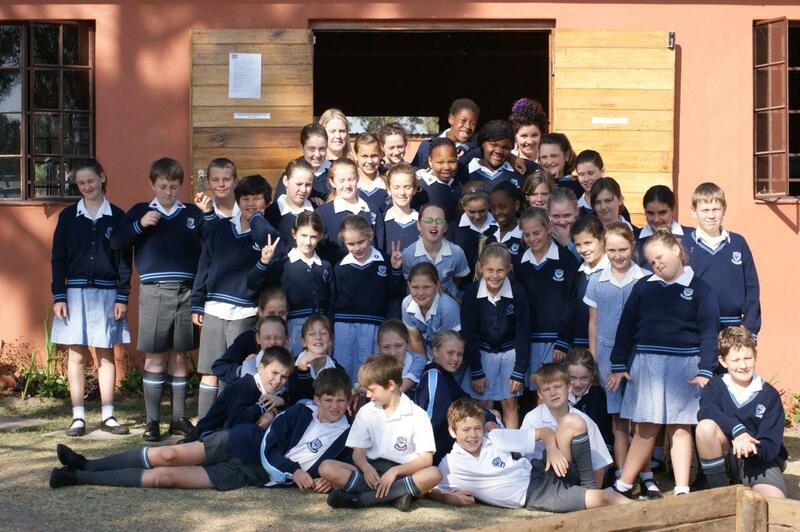 Liz Witherspoon took photos and will kindly provide each child with a CD of photo’s for their memory box. Phil Kinder took control at various points throughout the weekend and there were others too, but to each one of you, thank you so much. It was wonderful to get to know you all and to see everyone pulling together as a team. Would I do this again? With children and parents like you? In a heartbeat! Was it worth the stress and effort? Absolutely 100%! What were the benefits? Too many to list, mostly invisible and eternal. 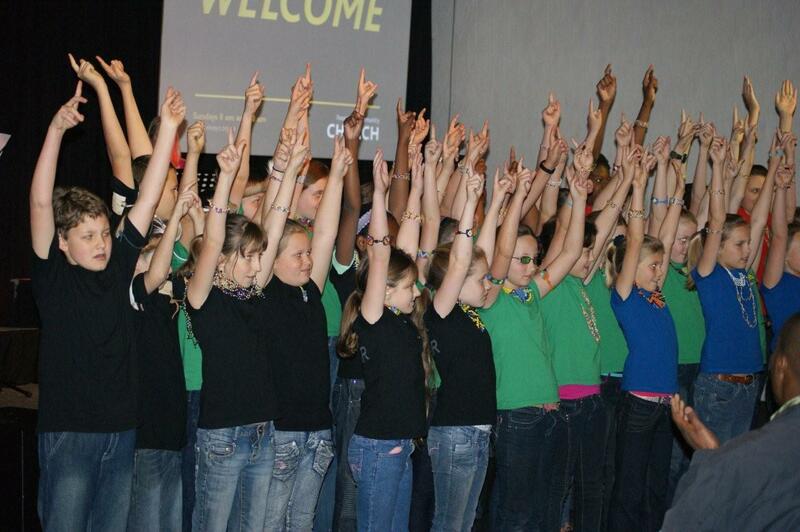 Choir Tour 2013 here we come!